Much has been written elsewhere about Hilary Rosen's comments on Ann Romney's suitability to be a voice for women in this country. The episode continues to be a gift to the GOP as it has not only backfired on the Democrat campaign ploy of painting the GOP as hostile to women, it has brought many former GOP factions together in astonishing fashion. Contrary to popular sentiment, Hilary Rosen is not an example of the worst of what faces the country from the liberal side. She committed a gaffe of epic proportions. When one commits a gaffe, it is often something that came out in an unintended way. I believe this is the case here and why, on its own, the fallout would otherwise fizzle. However, the statements are not isolated. They are not a one-time slip-up. She did not misspeak. Instead, her perspective is a symptom of the much larger underlying challenge we are facing as a country in the battle for hearts and minds and, therefore, the political mindset that will shape our society now and in the future. Her comments are a symptom of an underlying intolerance for values that exist outside pockets of liberal majority. Let's examine the comment. "Ann Romney has not worked a day in her life." On its face it has caused a firestorm of push-back from conservatives and liberals alike. Hilary Rosen certainly did not intend to imply that stay-at-home mothers do not have challenges. She herself took some time off from her career to stay at home with adopted twins. Yet this is one of the beauties of the political world--what you say and what you mean don't always come across the same. She's paying the price for what she said. What she meant, however, is far worse than what she said. Her clarification is that Ann Romney, not have worked in a salaried job while raising children, cannot possibly identify with the concerns of women since so many are single working mothers. Furthermore, she's rich, which means she could afford the "luxury" of staying at home. It is these two points that are the more subtle and more dangerous basis of what she meant. In their part of the liberal world, no mother stays home by choice. Those that do are either a) dependent on government entitlements or b) part of the fabulously wealthy who hire nannies to do all the mommy work anyway. To them a conscience decision to sacrifice career and/or income in exchange for deciding to raise children and run a household full-time does not or should not exist. To them, those that do are throwbacks to another time in American history and do not represent reality. Worse, they are to be scoffed at, derided, and sneered at. In their world, women work, and should work, because they a) need the income or b) do not want to impact their career by taking time off. There is nothing wrong with this perspective on its own. As Ann Romney stated, it's important to respect the decisions women make--she wasn't just referring to herself. The concern is the intolerance for decisions that do not reflect their own from either side. It is possible to be tolerant of others' decisions. You make your choice and I make mine and it's all good. Intolerance comes from insecurity in one's decision or from a desire for the country to be rid of traditional values. Regardless of the reasons behind the mindset that traditional, conservative culture is bad as it exists outside the two coasts and other liberal centers of thought, such as higher education, it is dangerous, because the more it is allowed to be considered as mainstream, the more acceptable it will seem to all when legislation is passed one step at a time that eliminates and erodes many of the values the rest of the country holds. It is this progression that cannot be allowed to continue unchecked. This is why Hilary Rosen has unintentionally given the country a gift. Not only has she rallied various factions in the GOP to unite against the larger and more dangerous opponent, she has put a spotlight on how "the other half live", i.e. those with different values, concerns, and goals from theirs and which need a representative voice in Congress and the Presidency. If handled correctly, it will become more and more clear that liberals are less equipped and motivated to understand and address the concerns of working and non-working women alike than they would have everyone believe conservatives are. I believe there is a false impression of what it meant by the term 'Strong woman". Women who compete on a daily bases with men for jobs and promotions, feel that they are the strong women because they are competing with men in the work place. Many choose this path out of necesity as single moms to take care of their families, persue careers, or both. With some women, a superiority complex develops over woman who chose a path of staying home and raising a family. Then there are those stay at home moms who feel that those woman who choose careers over having/raising a family as somehow being less feminine or lacking family values. Until women accept both paths as valid choices in life, this hostility will continue. I appreciate your thoughtful and well presented post. I am grateful that this discussion has been brought up--and not only because the GOP actually has stronger credentials on defending women (and men) who choose to raise a family--but it is time to remind these people that raising children IS work. It isn't just a job to be passed off on day-care centers, schools, or illegal nannies. I have given up an entire career and all of the income that might have generated to spend 21 years at home with my children. My husband and I live in a modest home, drive old cars, and most of our family vacations consist of getting in the car and driving to visit grandparents and family. The assumption from many of these Hilary-Rosen-type-people is that one must be either rich or stupid not to work. Early in our married lives, while my husband was struggling to find employment, I was told by a career counselor that he could place me more easily than my husband. I have a degree, some experience, and I speak Japanese. :-) We persisted, just as the Romneys did, and have become much more comfortable than we were, although our financial achievements are much, much more modest than theirs. I hate being condescended to. As if I don't know what the family finances are, or realize that my husband got a paycut this year because Arizona has been in a terrible slump. Another friend of mine says her husband has been basically downgraded to shift work and hourly wages. They can't afford to eat out or do fun things. She has also chosen to take care of her children. According to HR, we simply don't know anything about the economy? We are some of the hardest hit! Many, many parents choose their children over careers. They should be applauded for their choice. Welfare mothers--especially teenage ones-- (according to liberals) somehow deserve our compassion, but not women (or men) who don't depend on the government to raise their children, but take care of it themselves. This is an issue that I hope takes a substantial chunk out of Obama's approval ratings among voters--as it should! Nowhere have I seen most of the press acknowledge that when Ann Romney stayed home to raise their children, i.e., Harvard grad school, the Romneys didn't have lots of money, either. 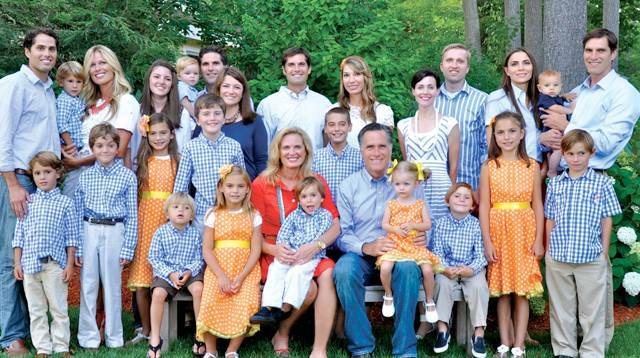 Ann Romney didn't marry a rich man, she just married a good one and had faith that he would make her proud--and he has. Great article Hamaca. It is good to see you because it reminds me that Gordon and Get Real at least have some good company. Thanks OJ--good to see you, too. Hope you're doing well. Haha, health wise, I am doing well. Politically, I am not doing well right now, things are well at the state level. Pic of the Day: Bill's Ready to Party! PPP Polling: Newt & Ron WHO?